It seems quaint now to think that Tottenham Hotspur didn’t have a designated third kit for any of their seasons with adidas. In each of the three campaigns, their away shorts and socks were white with navy trim so as to act as alternative options for the home shirts. Against Newcastle United at St James’ Park in 1999-2000, they wore yellow, but, the following season, with the navy not an option, they wore the home shirts rather than calling upon the yellow as a third. The new change shirts for 2001-02 were sky blue and they got an early airing against Blackburn Rovers at Ewood Park in August, worn with the home shorts and socks. However, when the two clubs reached the Worthington Cup final in February of 2002, with Blackburn drawn as the ‘home’ team, the Football League decided that neither of Spurs’ shirts were suitable and so an emergency third had to be produced. Adidas came up a shirt similar in shade to the 1999-2000 away, with the crest similarly recoloured, with the home shorts and socks again re-used. 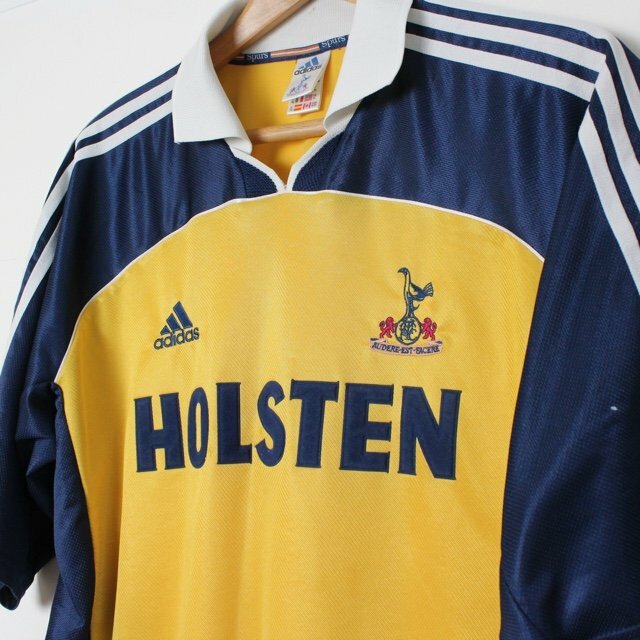 It is one of the rarest Spurs shirts, with no others produced beyond those prepared for the matchday squad. Had Tottenham won rather than losing 2-1, then perhaps there might have been a limited run of commemorative shirts, similar to the Manchester 1991 European Cup Winners’ Cup shirt. We shall never know. But @museumofjerseys wouldn’t have been a commemorative set produced.